More than the national flag; more than debates about immigration such as the one France is having; more than how elections are run and won; the way a nation celebrates and condoles reflects—I would argue—the way its citizens live and die. A few weeks ago, a street near my home was closed for a rangoli (called kolam in south India) competition. Walking through it was exhilarating on many levels. You expect the incongruous in India but to walk through an entire street in central Bangalore covered with stunning rangoli somehow brings India’s many paradoxes to the fore. The street was reminiscent of a village, with narrow homes and galis, but it was, in fact, a stone’s throw from Commercial Street, where hip shoppers stocked up on Christmas gifts. Here, in nearby Sivan Chetty Garden, however, shops sold hand-rolled Malabar parathas topped with fried green chillies, and aromatic onion pakoras to a regular customer base that consisted of flower vendors, autorickshaw drivers and security guards. 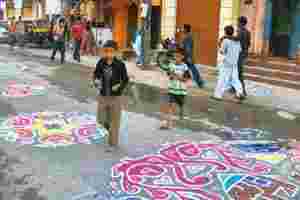 The atmosphere was festive as people strolled through the giant rangoli designs in bright colours. Pigtailed girls chased each other in an impromptu game of hide-and-seek. Grey-haired matrons sat on the pavement, catching up on rising rents and local gossip. At one end of the street, a makeshift dais was playing movie songs in preparation for the children’s fancy dress competition later that night. The women artists who drew the rangolis stood around waiting for the judges—two teachers from the nearby Chinmaya Vidyalaya—to come by. Many of these women were Hindu but some—going by their names—were Christian. The Hindus were celebrating the end of the Diwali season, while the Christians were welcoming the start of the Christmas season. Teresa, the woman who works in my home, tells me that this is common in poor Indian neighbourhoods. Her family would draw rangoli designs in front of the Mother Mary statue at the entrance of her home during Hindu festivals and her Hindu neighbours would help her make fried snacks such as “gala-gala" and “rose-murukku" for Christmas. I asked her why she drew rangolisduring Hindu festivals. “Why should our house look ugly when every house in the area has beautiful designs in front?" she said in explanation. Plus, she added, drawing rangoli wasn’t a religious thing. It was part of Indian “kalacharam", or culture. In fact, Teresa added, it was the newly converted Christians that she had a problem with. “They overdo everything," she said. “Play loud Christian songs in the morning and preach to us about the right way to pray and celebrate Christmas." Indian celebrations not only reveal this nation’s tolerance for chaos and its appetite for spontaneity. Our celebrations also reveal how infinitely adaptable the Indian mind is. It has to be, given the many paradoxes we confront on a daily, even hourly basis. Right now, luxury hotels in Bangalore are inviting regular guests for their cake-mixing ceremony. I’ve never been to one of these but it sure sounds good. Smells good too, I am sure, given that these Christmas cakes contain a rich and sometimes potent combination of ingredients. But alongside these scripted and carefully orchestrated events are impromptu celebrations where a community unites to draw designs, play music, share gifts, and catch up on gossip. During the children’s fancy dress, kids came, wearing kabuki-like powder make-up and donning costumes that turned them into Nehru, Miss India and Superman. They recited and sang. Every single one got a wrapped present. There it was: a tiny side street where fair-skinned Moplah Muslims sold Malabar parathas to a largely Hindu community celebrating the spirit of Christmas. To me, the best part of the Christmas season are the choirs that sprout around town. Bangalore is blessed with many: the St Mark’s Cathedral Choir, the Cecilian, the Holy Ghost, St John’s Church, Richmond Town Methodist and others. For a Hindu, listening to choirs takes some getting used to because they all sing in what Carnatic singers call the “false voice". But once you get past this mental block, the soaring churches with their beautiful acoustics will transport even the most agnostic. In Bangalore, I like the East Parade children’s choir and Glorious, a choir that has been gently nurtured for decades. Regional choirs that sing in Malayalam, Konkani, Tamil and Hindi offer a different pleasure. The St Xavier’s choir in Mapusa, Goa, sings a song that sounds to me like “Sangatham, Divya Sangatham," but it clearly is a Christian hymn. The Tamil version has a song called Geetham Geetham that is sung in a non-falsetto tune that sounds like any other Tamil song. Malayali choirs turn the language into Spanish with their variant intonations that descended from Vasco de Gama. And listening to these carols, I’ve got to say, gives me much more of a thrill than Handel’s Messiah or Oh Come All ye Faithful by the King’s College choir, which, as it happens, is what I am listening to now.